Warehouse Management systems are a critical component of an effective overall supply chain management systems solution. Warehouse Management being a critical component in logistics operations, we offer end-to-end solutions on this front. Lakshya is well equipped to manage and operate warehousing functions of receipt, unpacking, unit packing, put away, pick, pack, load and dispatch in accordance to agreed procedures including exceptions handling. Lakshya has deployed a WMS module which gives details related to the goods availability at the warehouse, and enhances efficiently managing warehouse operations and movement and placing of goods within the warehouse, thus giving increase in accuracy, reduction in labour costs, and greater ability to serve customers by reducing cycle times. 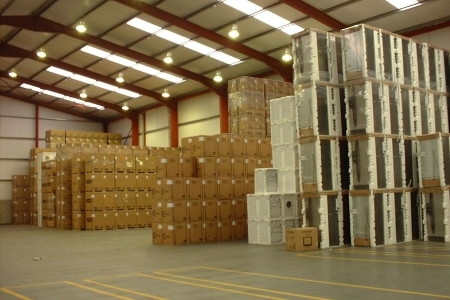 The WMS is designed primarily to support warehousing distribution and storage processes. It can be interfaced with automated storage systems such as horizontal and vertical carousels and lower crane systems. It can also interface with industrial devices such as barcode scanners, printers, weighing scales, smart cards and RF mobilizes to give customers a complete range of integrated inventory control solutions.